As workloads rapidly move to the cloud and users become more dependent on SaaS applications, reliable access becomes a demand IT must meet—especially since users expect seamless access between devices and locations. This means organizations like yours need security approach that provides a fine level of control over access, while adjusting to contextual factors like location and user behavior. Unlike the multi-access and point solutions of the past, this modern security approach must provide a broad and integrated view of distributed IT to help you identify and stay ahead of both internal threats and malicious external actors. Citrix Workspace delivers a simple, personalized experience to each user based on context and preferences. IT can set contextual policies to automatically adapt to changing conditions—grant or revoke access based on the user, location, device, or suspicious activity. Provide single sign-on (SSO) across web, SaaS, and virtual apps to simplify IT management and provide a better user experience. Citrix Workspace also enables a mobile workforce by seamlessly applying device and app control policies. Provide end-to-end encryption to secure data as it moves between the endpoint, network, and company resources. IT can leverage sophisticated container technology to secure apps and data on the device with a high-security encrypted vault for key storage. Because Citrix Workspace gives you visibility across endpoints, the network path, web traffic, data repositories, and web, virtual, and SaaS applications, it’s easier to detect malware. 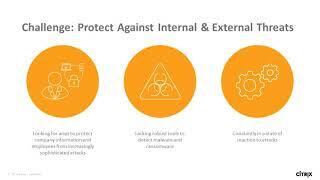 Isolate high-target apps to protect them against attacks. Inspect browsing activity and redirect suspicious site access to a safer, sand-boxed location to prevent any malicious activity or harmful data from entering the perimeter. Using policies, you can centrally control and manage blocked sites. Citrix Workspace also helps ensure business continuity by gathering input from the network and from web, virtual, and SaaS apps. Ensure the availability and performance of apps and services to users at all times through always-on connectivity, even during server or network outages, and protection against attacks that aim to disrupt business operations. Citrix Workspace secures your most sensitive business data, whether it’s in use, in motion, or at rest—in the data center or the cloud. You can easily exchange and collaborate on documents while ensuring industry-standard AES 256 encryption of all meta-data and content. Integrate with data loss provider (DLP) solutions for visibility and control over the sharing of sensitive data. Easily demonstrate compliance with visibility across your entire infrastructure. Citrix Workspace helps to better enforce compliance and governance aspects such as information rights management (IRM) and data loss prevention (DLP) by integrating users’ roles and responsibilities directly into how they use and interact with apps and data. This makes it easier to detect and prevent external or internal malicious attempts to steal sensitive data.